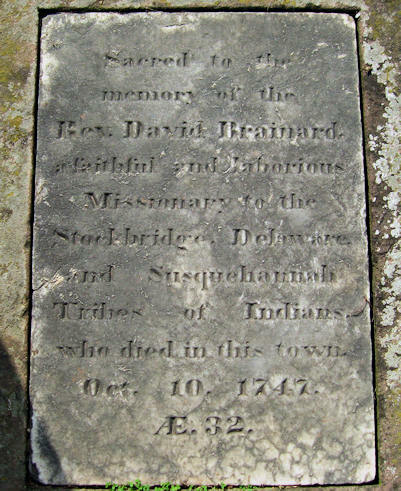 David Brainerd (1718-1747) was a missionary to the American Indians in New York, New Jersey, and eastern Pennsylvania. Born in Connecticut in 1718, he died of tuberculosis at the age of twenty-nine while being cared for in the home of Jonathan Edwards in Northampton, Massachusetts, by Edward's daughter, Jerusha. David and Jerusha were kindred spirits and she was buried next to him in Bridge Street Cemetery, Northampton, MA. His last words written in his diary, Oct. 2, 1749: "My soul was this day, at turns, sweetly set on God: I longed to be with him, that I might behold his glory. I felt sweetly disposed to commit all to him, even my dearest friends, my dearest flock, my absent brother, and all my concerns for time and eternity. O that his kingdom might come in the world; that they might all love and glorify him, for what he is in himself; and that that blessed Redeemer might "see of the travail of his soul, and be satisfied! Oh, come, Lord Jesus, come quickly! Amen." Inscription: Sacred to the memory of the Rev. David Brainerd. who died in this town. Oct. 10, 1747. Æ.32. Note: Inscription contains three errors: Spelling of Brainerd who died October 9, age 29. Note: Open gate into the cemetery may be on Parsons Street on west side. Take Bride Street at south side of cemetery to Parsons Street. Look for large Bates memorial building near southwest corner of cemetery (you can see an elementary school across the street from cemetery). Following the road on the west side of the Bates memorial, go north about 50 yards. 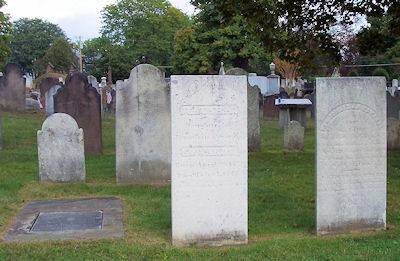 Brainerd's grave is on the right, marked by a large stone slab with marble insert flat on the ground. To the right is the gravestone for Jerusha Edwards. 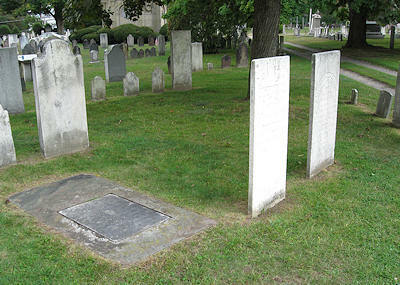 Although Jonathan Edwards is buried in the Princeton Cemetery, Princeton, New Jersey, there is a tall 19th century cenotaph for him (and his wife) at Bridge Street Cemetery, as well as a another smaller cenotaph to the right of the gravestone of his second daughter, Jerusha. From the front of the Bates family memorial, look toward the school across the street from the cemetery and you will see the tall cenotaph for Jonathan Edwards.